2017 was the year of Bitcoin. The cryptocurrency reached $19,000 briefly, financial services companies and hedge funds stood up bitcoin trading operations, and speculators dove in. Suddenly, the world was full of Bitcoin billionaires. Winklevoss twins, anyone? Sure, Bitcoin and blockchain technology have all the excitement, yet the reality is that the market is still figuring out how to apply both to B2B transactions. Bitcoin is too volatile for B2B, and blockchain is still evolving. Watch middlemen Visa and Mastercard, which have read the writing on the wall and are offering cross-border B2B payments via blockchain. The market is huge at $18.5 trillion and ripe for disruption. But that’s so 2020 or even 2024. What about 2018? Keep your eye on bitcoin, but embrace this 1 easy strategy to streamline business and open up a world of digital payments in 2018. Adopt e-Invoicing and create straight-through processes that can accommodate any payment type. Grab our POV, 9 Powerful Ways to Fuel Business Growth with E-Invoicing and Payments. You’ll learn how you can unlock multiple benefits, including better invoicing accuracy, faster payments, and lower risk with online insights and tools. As we all know, B2B payments are built for global acceptance, predictability and scale, reasons that companies have been slow to move off checks, which still constitute 1 out of every 3 payments. Yet digital payments are rising. They’re ACH, debit cards, and credit cards, but they solve a real problem for U.S. suppliers and their customers: convenience, trustworthiness, and accuracy. 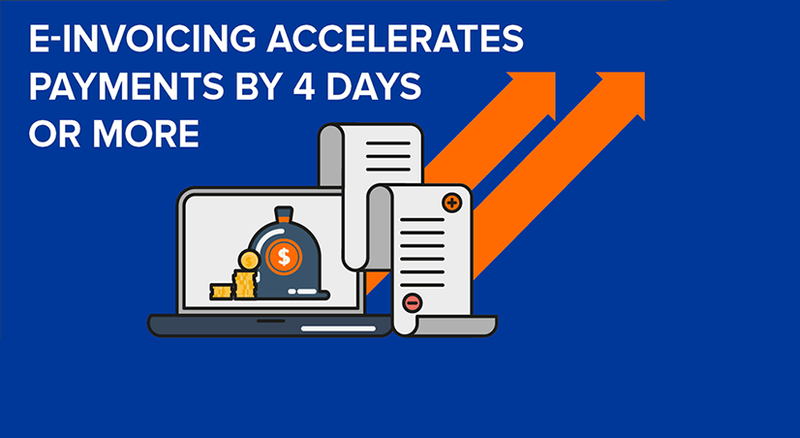 U.S. suppliers also benefit by speeding time to payment by 4 days or more and monitoring customer credit health online. Learn what you could do with 9 Powerful Ways to Fuel Business Growth with E-Invoicing and Payments. Accept digital payments with e-Invoicing.